Iron Chef America: Allez Cuisine! Kitchen becomes Stadium and the secret ingredient names the battle on the immensely popular Food Network program Iron Chef America. Battle Elk, or Battle Asparagus, for example are waged in one-hour culinary showdowns that pit accomplished chefs against masters from the pantheon of Iron Chefs. The program is an Americanized version of the Japanese program Iron Chef, which originally aired in the U. S. on The Food Network, complete with quirky overdubbing, which only added to its appeal. The program’s fictionalized back story – a legend related to the shows ‘chairman’, the culinary mastery of the chefs, and the genuine enthusiasm of the Japanese judges engaged a cult viewership. Each chef has a different culinary specialty that serves as a strategic advantage or detriment, depending on the challenger’s strengths and the “secret” ingredient. For example, during one memorable episode, Iron Chef Masaharu Moritmoto was thrown off his game by Battle Jalapeno Pepper – not a popular ingredient in his native country. Are the “secret” battle ingredients really secret? Yes and no. Participating chefs are briefed on a variety of potential “secret:” ingredients. By the time viewers see the unveiling of the secret ingredient, the chefs have run through a number of camera takes, so it is no longer a surprise to them. Kitchen Stadium is the dramatic name given to the program’s showdown venue. 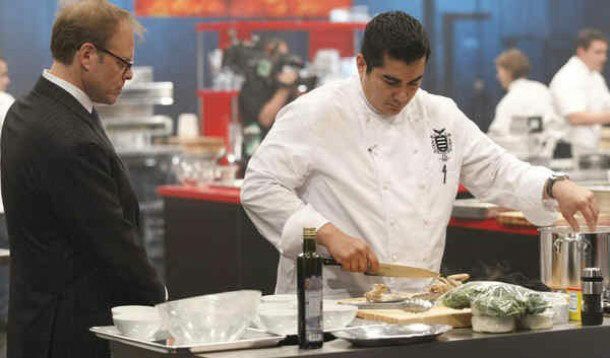 Part of the show’s appeal is the well-equipped facility, where Iron Chefs and challengers demonstrate the use of the most modern kitchen equipment, to produce highly sophisticated dishes for judgement. Ice cream machines and other advanced industrial devices are demystified for curious viewers. Judges are drawn from a variety of foodie segments, including restaurateurs, authors, and all around gastrophiles. Contestants submit 5 dishes each, providing brief descriptions of their approaches to the secret ingredient. Plates are judged on flavor, creativity, and presentation, before being given a numerical score. The contestant who submits the most highly rated menu wins the competition. Iron Chef America departs from its original Japanese counterpart in a number of key ways. The most notable difference, procedurally, is the use of assistant chefs or sous chefs. Iron Chef America allows the use of two sous chefs, by each contestant. It allows for more sophisticated output, and provides a great opportunity for up and coming chefs to be noticed by a larger audience. Another popular Food Network program, The Next Iron Chef, is a multi-week elimination tournament for highly acclaimed chefs, on which they compete for the highly coveted Iron Chef designation. Chefs Jose Garces, Marc Forgione, and Geoffrey Zakarian are the newest entries to the pantheon of culinary greatness known as Iron Chef America, and each earned his place on the panel by winning The Next Iron Chef.